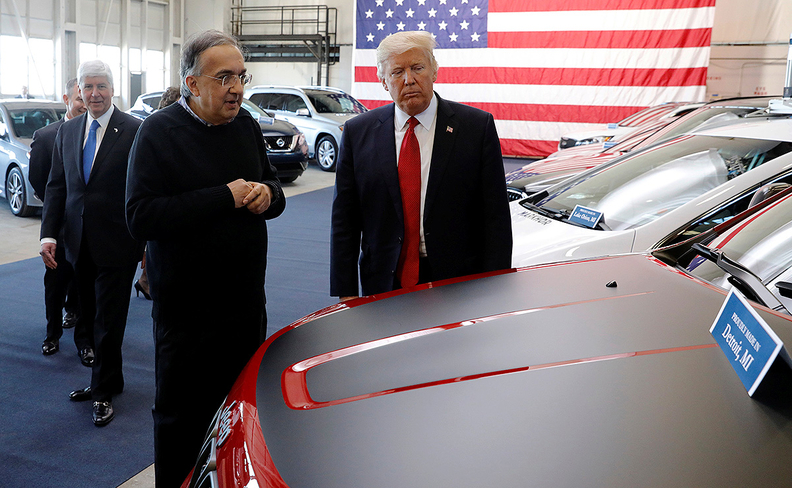 The suit is the latest blow to FCA CEO Sergio Marchionne, pictured earlier this year at an event in Michigan with U.S. President Donald Trump. DETROIT/WASHINGTON -- Fiat Chrysler Automobiles keeps running into trouble with the same government that arranged its shotgun marriage. With a U.S. Justice Department lawsuit filed Tuesday alleging violations of clean-air rules, the Italian-American carmaker now will have to defend itself against accusations it’s run afoul of environmental, safety and securities laws in the span of just a few years. The suit is the latest blow to CEO Sergio Marchionne, who reached a deal with the Obama administration to help rescue a bankrupt Chrysler during the global financial crisis. Since then, improper handling of safety issues led to the government-imposed hiring of a monitor to guard against delayed recalls. The Justice Department and Securities and Exchange Commission also have been investigating the carmaker’s sales reporting practices, after dealers accused the company of falsifying results. Regulators are arguing any undisclosed software is illegal, and that features within the automaker’s emissions control systems were designed to evade emissions tests. The federal lawsuit includes reference to “defeat devices,” a phrase popularized by the emissions crisis engulfing Volkswagen AG. While Marchionne has said Fiat Chrysler never set out to cheat emissions tests, the fallout could be significant for the carmaker, which lacks the global scale and financial resources of its German rival. Significant fines could disrupt Marchionne’s efforts to eliminate Fiat Chrysler’s 5.1 billion euros ($5.7 billion) in debt and accumulate a cash pile of at least 4 billion euros by the end of 2018. Achieving the goal has been the CEO’s focal point since abandoning efforts to merge with General Motors. The issue could cost Fiat Chrysler between $460 million and more than $1 billion, according to estimates from Barclays Plc, Mediobanca SpA and Evercore ISI. “The case is likely to take a long time, and should weigh on Fiat’s share price for some time, as the message regarding the execution of its 2018 plan is likely to be overwhelmed,” Alexis Albert, an analyst at Barclays, said in a report to clients. Fiat Chrysler “intends to defend itself vigorously, particularly against any claims that the company engaged in any deliberate scheme to install defeat devices to cheat U.S. emissions tests,” the automaker said in a statement Tuesday. The automaker’s shares fell 4.1 percent on Tuesday, but recovered 2.3 to close Wednesday at $10.56. Still, Fiat Chrysler has gained 46 percent since President Donald Trump’s election victory, driven in part by bets it will benefit most from Trump’s pledges to weaken environmental regulations. The civil lawsuit filed in federal court in Detroit alleges diesel engines in Jeep Grand Cherokee SUVs and Ram 1500 pickups for model years 2014 to 2016 perform worse in normal driving than during emissions tests. A criminal probe also is underway. An initial hearing of separate lawsuits brought by owners of the SUVs and pickups is set for Wednesday in San Francisco federal court, where VW emissions lawsuits were consolidated. The EPA said in a statement Tuesday it will try to move its case to the same court. Fiat Chrysler’s case isn’t helped by its history in recent years of fighting with regulators on an array of issues. The Justice Department and SEC started probing the company’s sales reporting after dealers alleged the automaker was inflating vehicle sales figures. After the initial accusations in January 2016, the company restated results twice, raising questions about whether shareholders were misled. Fiat Chrysler also has been penalized for inadequate handling of safety matters. It was fined $70 million in December 2015 by the National Highway Traffic Safety Administration after failing to report claims of deaths and injuries linked to potential vehicle defects, as required by law. Earlier in 2015, Fiat Chrysler agreed to a then-record $105 million civil penalty after a NHTSA probe found the company mishandled 23 recalls. The terms of the deal included the company’s hiring of Rodney Slater, a former U.S. transportation secretary, as an independent monitor. Fiat Chrysler’s recent federal run-ins highlight both a more combative stance by the government in enforcement cases, and the company’s willingness to push back, according to Stephanie Brinley, a senior automotive analyst at IHS Markit.